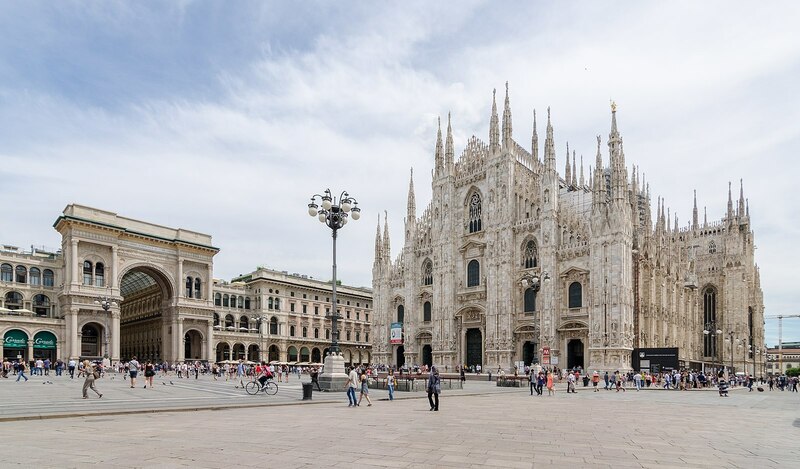 Before you decide where to stay in Milan, let’s break down those stereotypes that classify the city as a snobby fashion capital and nothing more. Sure, there are high-end boutiques spread across the cobblestone streets of the centre, but truly—there’s much more. Hovering above the cosmopolitan city of the North, a vibrant energy inspires even in-the-know locals to speed around with their chins up looking for latest gallery and restaurant openings. 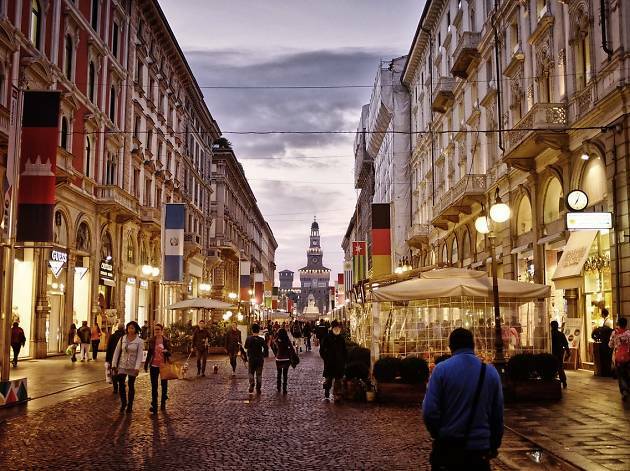 Whether in Brera for the artistic vibe, Navigli for well-crafted cocktails in some of the citys best bars, Porta Romana for local hangouts, Duomo for world-class attractions and sightseeing or Porta Nuova for the beautiful buildings, travellers will have a reason to keep coming back. 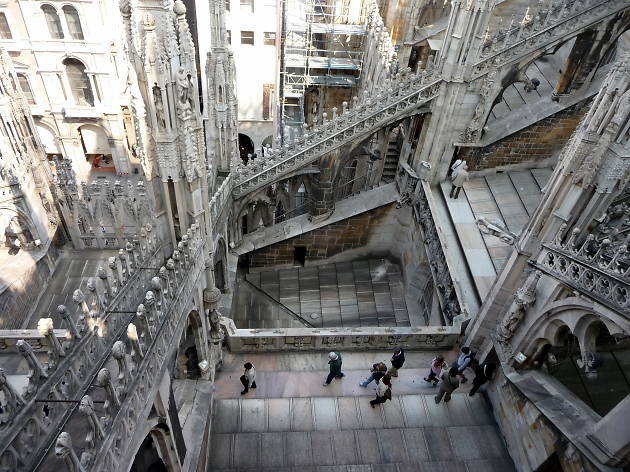 This is the city’s core; everything radiates from the Piazza named after the Milan Cathedral. Classified among the top five largest in the world, the gothic church features a special spire on top; the gold statue of the Virgin Mary, or “la Madunina” in dialect, raises high above the city and represents local pride. Admiring such majesty is a must for all first-timers who also look forward to walking through the sophisticated Galleria Vittorio Emanuele II, Europe’s oldest shopping mall. No matter the shopping intentions, glazing at the flawless windows of luxury brands such as Prada, Gucci and Dolce & Gabbana is a must-have experience. Take a stroll around Via Montenapoleone, Via Spiga and Via Sant'Andrea; once there, peek at the interior porch of Palazzo Morando. Passing by the tourist traps on Corso Vittorio Emanuele, the neighbourhood still holds a few gems like Luini, with its unbeatable deep-fried pizza rolls to go. For an informal lunch, order a plate of freshly cut charcuterie at Salsamenteria Parma (San Babila). Otherwise, head to the 7th floor of world’s best department store, Rinascente, for a variety of gourmet bites and food shopping. Stepping out of Rinascente, you will be right in front of STRAF bar. Treat yourself with a calice di vino and sip it on the street (if you’re there around 6pm, there’s also the possibility of complimentary finger foods). See the Scala Opera Theatre, at least from the outside, if a seat inside is something you can’t get a hold of. When mentioning Mandarin Orientals, a description may not be necessary to describe the exclusive and lavish atmosphere that characterises the hotels; especially if the location in question is in the heart of the Golden Quad. Featuring an eclectic decor and individually styled rooms, SINA The Gray is another valuable option to consider. Also, the quaint Ostello Bello, one of the best hostels in Italy and the world, is close by. Stop by at Excelsior Milano for an immersive and cutting-edge shopping experience. Adjacent to Milan’s fashion centre, Brera is the circumscribed artsy area, perfect for roaming around without a specific purpose or destination. The picturesque neighbourhood is one-of-a-kind and is known for having cradled some of the most influential Italian painters, writers and intellectuals. The former bohemian district is characterised by pedestrian-only streets, elegant buildings, antique stores and art galleries; a true landmark is the San Marco Church, which was erected in 1254 and even hosted young Mozart for three months in early 1770. Once you’ve seen, touched, smelled and tasted the finest luxuries of Milan, stretch your legs towards medieval Castello Sforzesco and check out the surrounding Parco Sempione, which ultimately leads to Napoleon’s Arch of Peace. For a true Milanese dinner, reserve a spot at Nabucco. Outdoor seating is available for a moonlit dinner, during which you’ll savor elaborate and creative specialties like the ricotta-filled pumpkin flowers. Cozy and tasteful is lunch at Fishbar de Milan, with its fresh catch dishes that include salmon tartare, Sicilian purple prawns, capesante and ceviche. Jamaica is the authentic hotspot in the neighbourhood. Open since 1911, the venue has hosted some of the most influential Italian personalities, like Lucio Fontana, Benito Mussolini and Giuseppe Ungaretti. Another not-to-miss venue is N’Ombra de Vin, with its historical cellar mentioned by A. Manzoni in “The Betrothed.” For people-watching, go to trendy Cinc. Shop! Pen and paper lovers will feel like they’re in heaven when entering Rigadritto, the hypothetical stationary shop of Neverland. Cavalli e Nastri is where fashionista spend time going through the vintage selection of 1950s flared skirts, disco-era dresses, Hermes scarves and Chanel suits. Probably one of the most affordable options in the area, The Style Hotel offers deluxe or superior rooms, as well as lavish suites. All provide comfort and feature attractive furnishings in addition to marble baths. Palazzo Parigi is another fairy tale accommodation with a trendy lounge bar and equipped 18th-century garden. Check out Palazzo Brera with its Pinacoteca and hidden Botanical Garden. The internationally known Italian city on water is Venice, so it often comes as a surprise to find out that even Milan has a few canals: Naviglio Grande, and Naviglio Pavese. Locals flock here to see the sun sink down over the smooth water while spilling thoughtfully-crafted drinks onto the streets. There are plenty of bars, antique stores and vintage boutiques to check out here. Start the neighbourhood discoveries walking from Colonne di San Lorenzo, down Corso Ticinese, to Piazza Ventiquattro Maggio. Many Milan restaurants embrace the farm-to-table philosophy and Erba Brusca is no exception. If you’re looking for something traditional, Osteria Delbinari is the quintessential Milanese choice. It is almost impossible to go wrong entering any of the bars alongside the Naviglio Grande, but if you want to have a few names in mind, Bond, Rita and Mag Cafè are all great options. Consider booking a Happy Boat ride (with aperitivo included) on a Friday or Saturday at 7:30 pm. 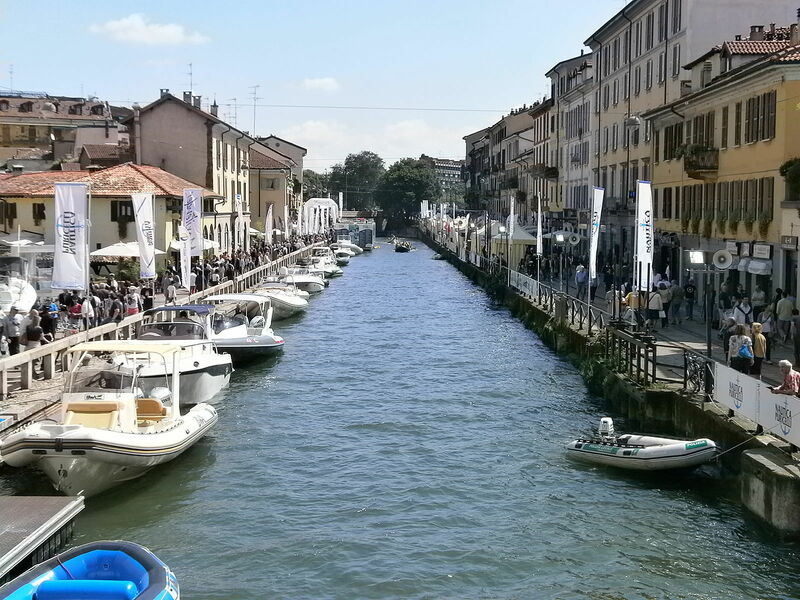 Head to Alzaia Naviglio Grande 4 and be ready for a 75-minute tour. Former perfume factory Magna Pars Suites has turned into an all-suite hotel featuring a landscaped garden, fine-dining restaurant, wine cellar, trendy bar, gym and spa. Take an after-dinner stroll along Naviglio Grande, to etch in your memory the reflection of streetlamps and historical wash-houses (such as El Brellin) on the water below. 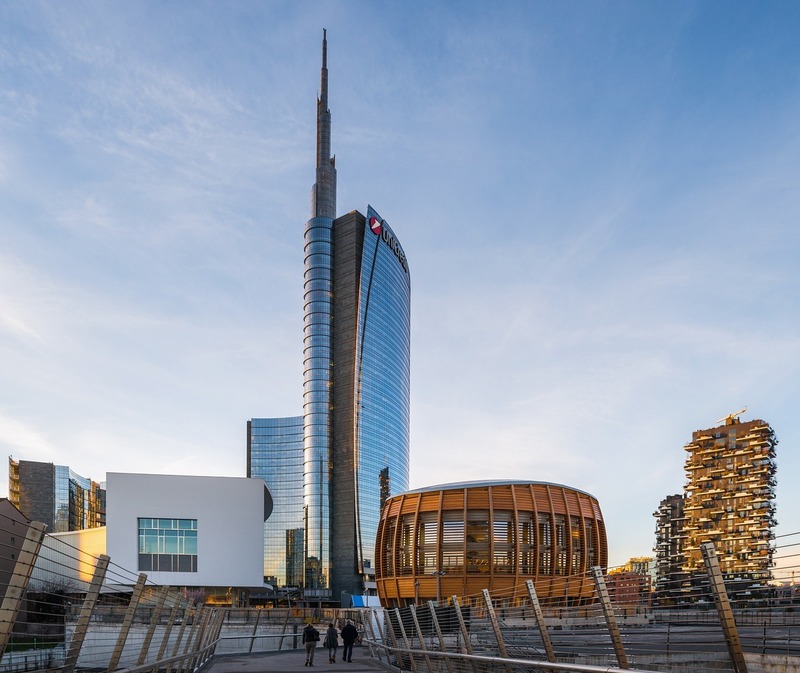 Full of newly built skyscrapers and modern plazas, Porta Nuova is the latest face of Milan. 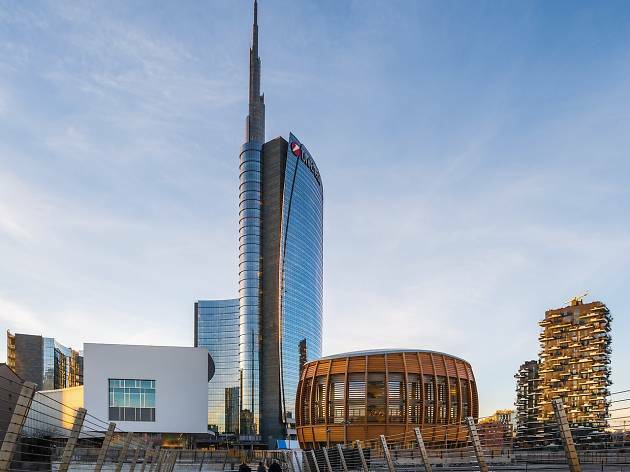 While you’re there, observe the dramatic contrast between 19th-century remains and futuristic-looking buildings; a vivid example is the mirrored Unicredit Tower on Corso Garibaldi which forms the background of the neoclassical arch in Piazza XXV Aprile. Proceed on Corso Como to acquaint yourself with pulsating Gae Aulenti; a square filled with tasteful shops, buzzy restaurants and modern cafes. You may already have heard of Bosco Verticale, the sustainable residential building that received worldwide attention after being awarded for its architectural innovation. Located right next to Google headquarters, the Vertical Forest opens the door to another alternative neighbourhood worth exploring. Formerly known as the Workers’ District, Isola is today’s hipster-land, where buildings’ façades have turned into artists’ playgrounds and former warehouses into restaurants. La Briciola is the Milanese institution for meat that melts into your mouth. If you want something more exciting, dive into one of the trendiest scenes of the moment ordering ceviche and tostadas at Besame Mucho. Otherwise, keep it balanced and taste a proper risotto al dente at rustic Guyot. Raise glasses with the elite at Radio Rooftop Bar or rub shoulders with the locals at the first Italian micro-distillery, The Botanical Club. No trip is complete without shopping for souvenirs. And we don’t mean the Duomo miniature, especially when there are places like Cargo High-Tech that have all the coolest and quirkiest local goods. Great gifts for foodies can be found at Eataly, across the corner. Fancy globetrotters will be easily captivated by the charm of VIU Milan. Its glass façade, spectacularly framed with living greenery, stands out in bustling Porta Nuova. Another solid and friendly alternative is B&B Porta Garibaldi. Go to Corso Como 10 for a cup of tea, light lunch or shopping extravaganza at its adjacent boutique. Don’t forget to walk up to Galleria Carla Sozzani and check the latest art exhibition. Too often this Roman-inspired neighbourhood doesn’t make it into the guidebooks. 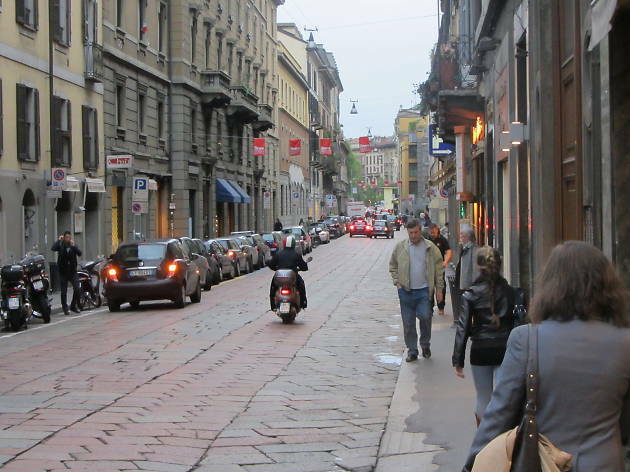 Located in Piazzale Medaglie d’Oro, at the bottom of Corso Porta Romana, this is one of the trendiest neighbourhoods for local hangouts throughout the day. 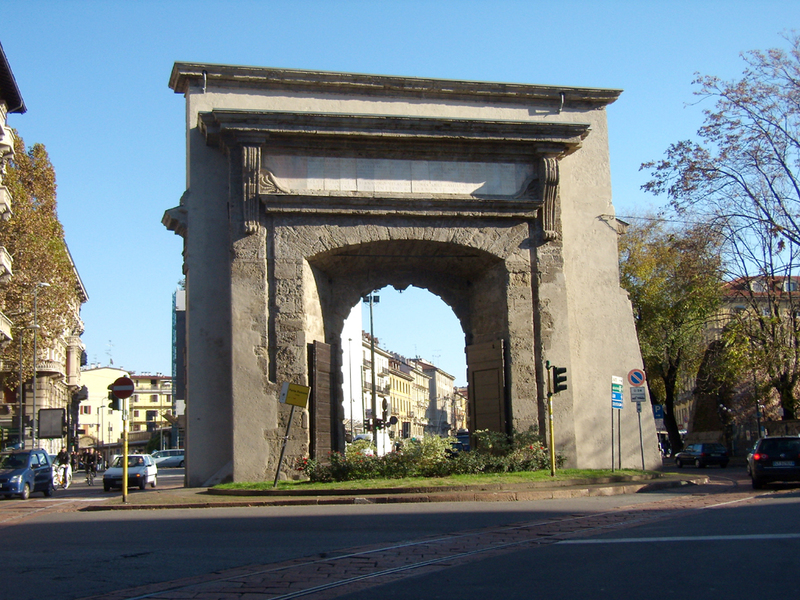 Full of restaurants, bars and cafes, Porta Romana is an important connector between the historical city centre and upcoming areas, home to Fondazione Prada and Wes Anderson’s Bar Luce. Begin the district exploration by biting into one of the mouth-watering signature sandwiches at Crocetta Panini d’Autore, then admire what’s left of the 16th-century Spanish walls in the main piazzale and keep walking through the bar-filled Via Muratori to eventually discover one of Milan’s best kept secrets: Cascina Cuccagna. If you are up to try something different and unique, Trippa is a cozy Italian trattoria serving up unique dishes like tripe. It may seem difficult to take a break from Italian food while in Italy, but fine Japanese restaurant IZU gives you a reason to at least consider it. Eclectically decorated Lacerba offers a homey atmosphere for pre-dinner, or after-dinner glass clinking. The mixology experts here know how to properly stir and twist classic recipes. However, if wine is more of your thing, Il Cavallante enoteca welcomes new clients with as much friendliness as they do regulars. Sit in the outdoor patio of Panificio Davide Longoni, savoring focaccia bread with cappuccino, then head to Fontana Milano 1915 where a third generation Milanese runs the leather goods family business, keeping “Made in Italy” standards high. Your best option is to stay local, renting an apartment in a typical casa a ringhiera. If that’s a bit too audacious, try business-attire UNA Hotel Milano or Hotel Five. Pamper yourself with a one-of-a-kind sauna experience inside of an iconic Milanese street car at QC Terme Milano. 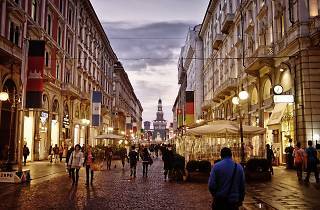 Looking for more Milan travel tips? 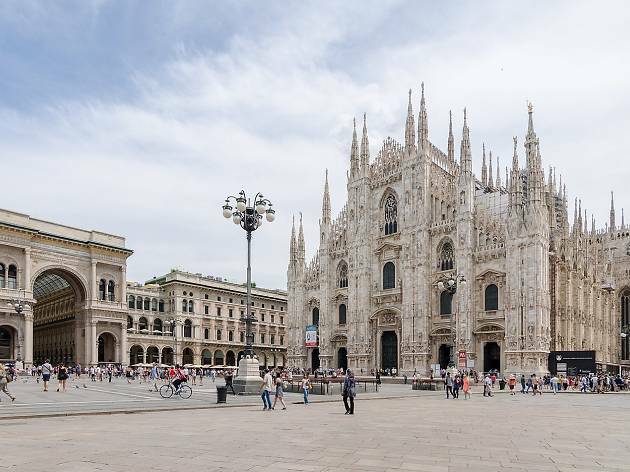 We’ve gathered some travel tips to help first-time Milan visitors find the often-surprising wonders hidden underneath, from beautiful buildings and vantage points to delicious drinks at some of the city’s best bars, not to mention some true fashion bargains.